Paris may be known for its haute cuisine, fashion and iconic landmarks like the Eiffel Tower, but it is equally steeped in literary history that shouldn’t go undiscovered on your next trip to the French capital. Such greats as Simone de Beauvoir, James Baldwin, F. Scott Fitzgerald and Ernest Hemingway all earned their chops in Paris and left behind a literary legacy in numerous spots around the city. If you’re a writer yourself, you’d be hard-pressed to find better inspiration than these 10 bars, cafes, bookshops, gardens and restaurants that once harbored so many great minds. And if you’re an avid literary buff, what better way to spend an afternoon than sitting with a good book in one of these haunts, soaking up the city’s cultural and historical bounty? From Jean-Paul Sartre sipping coffee at Les Deux Magots to Hemingway’s ode to La Closerie des Lilas in A Moveable Feast, these ten places will call up all kinds of benign, bookish ghosts. Read on to strike out on your own self-guided literary tour of the city. The tour begins in south Paris near Montparnasse, but feel free to start yours anywhere, and see as many of these storied spots as you have time and energy for. You can do the whole tour on foot if you wish, or take the methttps://www.tripsavvy.com/how-to-use-paris-public-transportation-1618925. We've put the cafes in an order that allows you to follow an easy trajectory, but make sure you have a good street map of Paris or smartphone maps to help direct you. Biblioteca del Arte/Some rights reserved under the Creative Commons license. This chic cafe-bar and restaurant near Montparnasse, known for its fresh oysters, beef tartar and terrace overflowing with lilacs, was once the stomping grounds of French and American writers alike. 19th-century French poets Paul Verlaine and Charles Baudelaire regularly grabbed drinks here, while fellow poet Paul Fort met here every Tuesday to read poems with the likes of Guillaume Apollinaire and Max Jacob. Samuel Beckett, Man Ray, Oscar Wilde and Jean-Paul Sartre were just some of the many writers and poets who frequented the spot, but it was the American intelligentsia of the 1920s and 1930s that truly made it stand out. Fitzgerald, Hemingway and Henry Miller often stopped for a drink, and Hemingway wrote about the bar in his memoir of Paris, A Moveable Feast. Fitzgerald also first gave his manuscript of The Great Gatsby to his friend Hemingway to read here, according to legend. Curtis MacNewton/Some rights reserved under Creative Commons. Only a few minutes' walk from the Closerie des Lilas is the second stop on the self-guided tour of literary Paris. The Luxembourg gardens, with their immaculate shrubbery, elegantly manicured trees, and bursting flower arrangements, are a relaxing place to stroll away on a sunny afternoon. Paris’s literary crowd certainly wasn’t blind to its charms, and the park has been a central part of some of France’s best known works. Victor Hugo spotlighted the park in his masterpiece Les Miserables – it becomes the site of the first meeting between Marius Pontmercy and Cosette. Henry James also features the gardens in The Ambassadors, and the final scene of William Faulkner’s Sanctuary takes place here. When Paris’s writers weren’t singing the praises of the illustrious garden in their work, they were enjoying it themselves – Paul Verlaine and André Gide are said to have spent time wandering in the park for inspiration. Later, the garden was a favorite spot for American writer and literary salon doyenne Gertrude Stein and her partner, Alice B. Toklas: they lived only a few blocks away at 27 Rue de Fleurus, and hosted countless artists and writers in their apartment. It was also favored by fellow American expatriate writers Richard Wright, James Baldwin, and Chester Himes, who frequented the Cafe Tournon just across the way (see next step in the tour). ©2009 Discover Paris. All rights reserved. Nestled in close reach of the Palais du Luxembourg and gardens, this cafe is a lesser-known but important stop on our tour. Like much of Paris’s literary history, American writers had a prominent place in it, and Café Tournon was no exception. The café became a regular stop for such African-American literary figures as James Baldwin, Richard Wright and William Gardner Smith in the 1950s. According to Hazel Rowley’s 2001 biography, Richard Wright: the Life and Times, Wright often stopped by in the afternoons to have a coffee, play the pinball machine and meet with fellow writers and friends. His friend and fellow writer Chester Himes often dropped in, and the café became not only synonymous with Wright but also a place to exchange news about America. Later, the café held onto its literary bent, and journalist George Plimpton made it his café of choice. It was here that literary magazine The Paris Review first took shape under Plimpton's leadership. You can read more about the Luxembourg garden's connections to black literary history in Paris in our review of this dedicated tour. A stop at this quaint English bookstore overlooking the Seine and Notre Dame Cathedral has become commonplace for most tourists. But what many may not know is that Shakespeare and Company originally functioned as a lending library and bookseller further up the road at rue de l’Odeon under the ownership of American expat and literary sponsor Sylvia Beach. From 1921 to 1940, the bookshop was the stomping grounds of such famed Anglo-American writers as Hemingway, Fitzgerald, Gertrude Stein, and Ezra Pound. Irish writer James Joyce reportedly used the shop as his office. After the original shop closed, in 1951, George Whitman opened a new bookshop and named it Shakespeare and Company in honor of Beach and her enormous literary legacy. It soon became a prized haven for beat poets like Allen Ginsberg and William S. Burroughs, and today nurtures the ambitions of young aspiring writers who stay at the store in exchange for work, known as "Tumbleweeds". If there’s one area of Paris that says literary history, it’s Saint-Germain-des-Prés; and if one place could epitomize it, it would probably be Les Deux Magots. This chic cafe has over the years been appropriated by a strange mix of the city’s most wealthy and the average tourist. But Les Deux Magots was once a hub for Paris’s brightest literary stars and their admirers. Jean-Paul Sartre, Simone de Beauvoir and Albert Camus often stopped here for strong coffee and philosophical debate, before heading across the street to another charming spot, the Café de Flore (see next step in the tour). Hemingway and James Joyce made sure to come here from time to time, as well. The café became such a hub of literary activity that it began offering its own literary prize starting in 1933. Just across the way from Les Deux Magots, and occupying just as much space in France’s literary history, is the Café de Flore. Apollinaire and Salmon would come here to work on their arts review, “Les Soirées de Paris,” while André Breton spent entire days here and across the street at Les Deux Magots. French poet Jacques Prevert also set up shop at the café, bringing in groups of friends for the night. The café gained new fame in the 1940s and 50s, when it became a hot spot for existentialism. Power couple Simone de Beauvoir and Jean-Paul Sartre would spend a good part of their days here, reportedly hashing out their philosophies from morning till night. The café, in keeping with its long friendly rivalry with Les Deux Magots, also hosts an annual literary prize. Next up on our tour is a distinguished old restaurant and bar situated on the banks of the Seine, boasting over 150 years of literary history. First opened in the late 18th century, Lapérouse was a favorite "salon" for literary greats including Victor Hugo, George Sand, Alfred de Musset, and Gustave Flaubert during the mid-19th century, using the private second-floor rooms to meet and write their chef d'oeuvres. While later on, these same rooms would become notorious for bawdy trysts, the restaurant is today an esteemed institution: Its old-world charm, including a zinc bar complete with grand piano and graceful old moldings, continues to attract the literary and cultural elite. This is simply one of the most romantic restaurants in Paris, perfect for a tete a tete or a quiet drink alone with your pen and notebook. Next up on your self-guided tour is the spot reputed to be the oldest public cafe in Paris, and just a few blocks away from the Flore and Magots. Founded in 1686 by Sicilian chef Francesco Procopio dei Coltelli, this was a major literary and philosophical hotspot in the eighteenth century, hosting notable figures such as satirical master Voltaire and encyclopedist, philosopher and art critic Denis Diderot. Fueled and inspired by a strange new muddy brew called "coffee", Voltaire, Diderot and other major eighteenth-century thinkers and writers including Jean-Jacques Rousseau and American revolutionaries Benjamin Franklin and Thomas Jefferson met here to engage in endless hours of heated debate and conversation. Voltaire was rumored to drink more than 40 cups of caffeinated brew a day, and the encyclopedia writers who gave the world the gift of democratic knowledge were also hooked on the stuff. No wonder they got so much done. Later, nineteenth-century Romantic writers like George Sand and Alfred de Musset also frequented the Procope, and its status as a literary legend has stuck. Now the historic spot, refurbished in the late 1980s to mimic the old eighteenth-century style, holds relics such as Voltaire's desk. It may be touristy, but it's well worth a look. Pablo Sanchez/Some rights reserved under Creative Commons. It's time to cross the Seine and head over to the right bank to see a couple of final spots in the French capital that were coveted by writers. The luxurious Hotel Ritz is more of a palace, welcoming some of the world’s wealthiest and most famous guests. While the hotel’s legacy as a truly “ritzy” spot was cemented long before Ernest Hemingway made his mark – French writer Marcel Proust once hosted extravagant dinner parties here – it was Ernest who came to epitomize the five-star hotel. The bar has since been named after him-- and is one of the most stylish hotel bars in Paris. Having undergone extensive renovations in 2015, the Ritz can be accessed from the Place Vendome, where it has sat since it first opened its doors in 1898. Image courtesy of Café de la Paix. The last stop on our tour is this right-bank cafe with some serious literary cred. 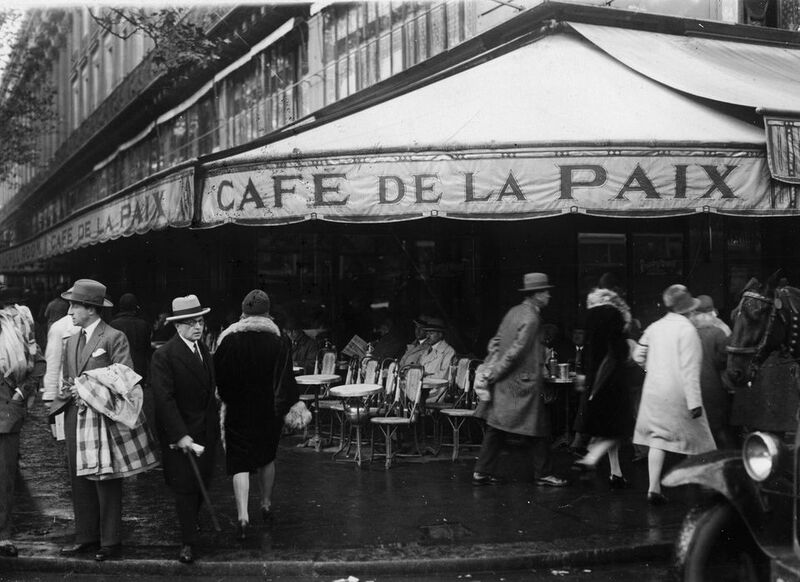 It is no surprise that some of Paris’s aspiring and famous writers took their coffee or dinner at the Café de la Paix. Situated just across the street from the ornate Opera Garnier with its glimmering gold moldings, the café was in prime position for inspiring its customers. It opened in 1862 as part of the Grand Hotel de la Paix, and it soon became a regular dining spot for witty pen Oscar Wilde. French writers Marcel Proust, Emile Zola and Guy de Maupassant also often took their dinner here before heading over the road to attend the opera. BHV Department Store: Discover Paris' Favorite "Bazaar"